On the 24th November I picked up Julie and we headed to a Pub in troutbeck to meet Mr. Kilburn. The pub turned out to be closed and being a hour early me and Julie decided to opt for the nearest place for one then head back to the meeting point to meet Paul. After Mr. Sophistication joined us we went back to the other pub for an encore. Light had disappeared on reaching the summit and it was time to pitch our three tents. Daveswildcamping kitchen would be ‘dare I say it!’ -steak with some liver, onions, mushrooms some stirfry veggies and sauce. As darkness fell it became colder and colder, frost appeared on our tents we stood and talked a while and Julie been the female in the group 😉 couldn’t stand the cold no longer and retired. Me and Paul stood outside nattering till 2:30am before heading in. Great night was had by all of us and it was nice to meet Julie for the first time. 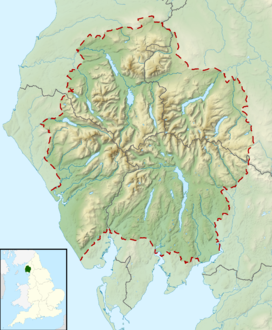 Little Mell Fell is a fell in the English Lake District. It is an outlier of the Eastern Fells, standing to the north of Ullswater. Two miles to the north west is Great Mell Fell, often thought of as its 'twin'. In common with its slightly higher sibling, Little Mell Fell presents as a rounded dome with fairly steep grass slopes, and is relatively isolated from other fells. Alfred Wainwright in his Pictorial Guide to the Lakeland Fells described it as "an uninspiring, unattractive bare and rounded hump- the sublime touch that made a wonderland of the district overlooked Little Mell." Unlike Great Mell Fell however, it does have one visible connection to other fells. Due south from the summit is The Hause, a narrow col crossed by a minor road. From here a ridge of high ground swings south west, running parallel to the shore of Ullswater until it culminates at Gowbarrow Fell. There are a number of intermediate tops along the way, including Great Meldrum (1,433 ft) Little Meldrum (1,325 ft) and Watermillock Common (1,391 ft, unnamed on Ordnance Survey maps). Little Mell Fell also manages to send a short grassy spur out to the north west. Between this and the main body of the fell is the source of Thackthwaite Gill, a tributary of Dacre Beck and, ultimately, of the Eden. The fell has a few tiny areas of broadleaved plantation, but otherwise is bare, the lower slopes being parcelled up into fields for agriculture. Notices indicate the presence of adders on the fell. The summit carries an OS triangulation column and provides views of the lower reach of Ullswater. The mountain panorama takes in much of the Eastern and Far Eastern Fells, but the view is robbed of foreground by the gentle curvature of the grassy summit. Minor roads surround the fell on all sides but The Hause, blessed with parking spaces, is the usual setting-off point for one of the easiest ascents of a Wainwright. Cove Camping Park to the south east provides another alternative for a pathless ascent, as does Thackthwaite in the north, following Thackthwaite Gill. Public access through Thackthwaite has however been a source of recent dispute with residents. This entry was posted	on Thursday, December 5th, 2013 at 5:38 pm	and is filed under Little Mell Fell. You can follow any responses to this entry through the RSS 2.0 feed. Both comments and pings are currently closed. Great sunrise, looks amazing. What a life! Powered by WordPress v 4.7.13. Page in 0.469 seconds.